...the grass is riz, I wonder where the birdies iz. I've seen several versions of this rhyme lately because indeed, spring is riz. We don't have here the wild freesias on the footpath verge as we had in Killara, but there's wattle, grevilleas, jasmine and other flower scents wafting around in the breeze. I walked up to King Street by a different route the other day and came on a community garden. There's quite a few of these in the area which is fairly eco conscious. This garden was different. Part of the footpath in front of four terrace houses had had a straw and hay garden laid on it. Plants were very healthy and a URL painted on a sign gave further details of coming plantings. I wondered if the plants were safe but it did not look plundered. It's warm here too today and the weather has been beautiful. Brilliantly sunny with a clear blue sky. So if the grass has riz, where is my knitting spring feeling too? Definitely not riz. I'm knitting, some every day. I am just not very enthused about it at the moment. I'll have a couple of hours tomorrow in the train as I go to and from the Central Coast. I plan on sock knitting and hope to have one pair finished this week. I'm about 1/3 of the way down the body of the top down asymmetrical vest. It's slow going, I really don't like knitting with large needles and there are a lot of stitches each row. 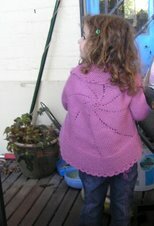 I've also done a sixteen stitch pattern down the edge of the wrapover part of the vest. 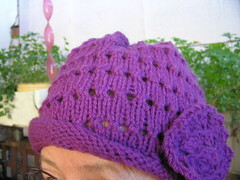 It has two bobbles in twelve rows and a bit of a lacy twig pattern. It's not difficult but for the life of me the pattern won't stick in my mind at the moment, there's lots of other stuff swirling around in there. I need to keep the pattern book open so I can follow it. Part of the stuff swirling around is thoughts of the future. My old home will be photographed this week and advertising starts next week with an auction towards the end of October. I find it very unsettling. I know what the agent has said it should go for but as my son said, it's only worth what people will pay on the day. I'd really like a house, rather than a unit and have been spending a lot of time on both the major real estate sale sites, so I hope it's worth a lot on the day. I'm the cautious type so would not be buying till my place is definitely sold. Still, it gives me an idea of what's around and of prices. I'm astounded at some of the pictures of places for sale. I wonder if some of those are rental places. I'm surprised at the utter mess of some places. I suppose the occupant has no real interest in the sale, but some have had dirty washing up all over the kitchen, tables uncleared, boxes stacked on boxes and some are obviously quite filthy. Then again, there are some where there are holes in walls, blinds not only down but broken and sagging. We were fortunate that although the place here had been only ever rented, the tenants were as fussy as if they were owners. Everything was spotless anytime DIL looked at the place. She looked at some places where she had to pick her way in bedrooms over piles of dirty underwear on the floor. I don't like housework but could not possibly live like that. So enjoy the pictures. The grevilleas are in our place, the wattle is two doors up and the jasmine two doors down the other way. It does look so Springy!! It's nice to have some sunny weather at last. Oh the whole buying and selling houses seems very stressful to me, but your son is right- you get the price people are prepared to pay and vice versa. I think if prices are high you get more money buy you pay more for a house: lower prices, so less money but houses should cost less. Our landlord decided to sell the house we were living in. We found out when I saw it in the housing section of the local rag. We didn't keep the place spotless but it was reasonable, not at all gross. But the agent selling the place thought he had the right to walk in with people whenever he wanted - he put a lock box on and would just walk on in at any hour. So we became less cooperative and indeed downright obstructive if we had the opportunity. Maybe some of the renters are feeling like we did.